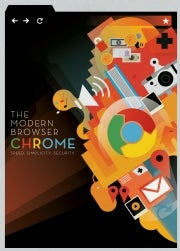 Illustration by Mike Lemanski and courtesy of Google's Chrome blog. Today marks the second anniversary of the release of Google's Chrome browser. While Chrome hasn't completely taken the world of Web browsing by storm, it has made a lasting impact on the market for Web browsers -- a decent accomplishment for a two-year-old. Google is celebrating Chrome's birthday by releasing a brand new stable build of Chrome, which is already available for download, but let's mark the occasion in our way: by looking back at the ways in which Chrome has shaped the Web browsers we use today. The first beta of Google Chrome made its debut on September 2, 2008, and most reviewers instantly lauded its streamlined, minimalistic design. PCWorld blogger J.R. Raphael noted, "Calling the design of Chrome's interface streamlined is an understatement. The program barely looks like a program, and the vast majority of your screen space is devoted to the site you're visiting -- with no buttons or logos hogging space." Google's hallmark is a clean, uncluttered interface -- remember what search engines looked like before Google came along? -- that many of its search rivals have tried to emulate. Since the launch of Chrome, Google's browser rivals have tried to copy its minimalistic look, with varying degrees of success. Whether they succeed or not, I applaud the effort -- and I thank Chrome for reminding others that we're browsing the Web in order to look at a Web site, not to look at a browser. Google is famous for keeping products in a beta stage forever (and ever), but the company did not do this to Chrome. Just a few months after the release of the first version of Chrome, the browser exited beta -- and has been steadily updated since then. The stable build released today is the sixth stable release of the Windows version in the past two years, but Google does not call it Chrome 6 -- the browser is still just plain old Chrome. Rather than revving up for big releases, Google simply adds functionality on an ongoing basis -- something Microsoft, in particular, might do well to emulate. After just one day of availability, Chrome managed to account for 1 percent of the browser market. While its rise since then hasn't been quite as meteoric, Chrome has seen a steady increase in users. Chrome held 7.5 percent of the browser market in August 2010, putting it in third place behind Internet Explorer and Firefox, according to the most recent numbers from Net Applications. Even though Chrome hasn't pushed IE -- or even Firefox -- to an early demise, this kind of competition is good for everyone. It gives users more choices and forces rivals to innovate. Google plans to release what it calls a "Web Store" for Chrome next month, which will offer a place for Chrome users to find and download Web apps. The idea is a bit unusual, and we've yet to see the store in action, but it has the potential to do for Web browsers what Apple did for smartphones. Apple's App Store was the first true easy-to-access mobile marketplace; now every major smartphone platform offers one. It seems pretty likely that we'll be saying the same thing about all major Web browsers sometime soon. These are just a few of the ways Google Chrome has shaped the browser market. What do you think its lasting effects will be? Sound off in the comments.